The heads of two U.S.-based charity organizations are this year's winners of the World Food Prize, the prestigious $250,000 award honoring accomplishments that have improved the global food supply. This year's World Food Prize went to David Beckmann, president of Bread for the World, and Jo Luck, CEO of Heifer International. It's the first time the award has gone to leaders of non-governmental organizations. The award citation lauds Luck for her leadership of Heifer International, which it describes as, "one of the premier hunger-fighting non-profit organizations anywhere in the world." 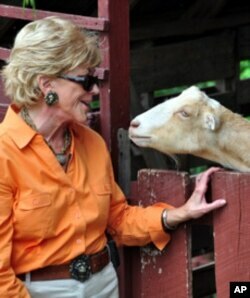 Jo Luck leads Heifer International, which helps people out of poverty and hunger with gifts of livestock. Heifer International begins helping people out of poverty and hunger with gifts of livestock. Along with the gift comes extensive training in how to raise the animals and lead the community. The animals provide food as well as income. And recipients then pass on the animals' offspring to other members of the community. Jo Luck says "passing on the gift" is the most important part of Heifer's work. "People pass on their gifts of not just animals," she says. "They pass on those gifts of training and leadership. We've seen cases where we've been gone five and 10 years and we go back and they've developed roads and built schools and they have other communities receiving the animals and the training. You just give them those resources, that training and opportunity and you can't hold them back." She tells the story of a Chinese man who received a set of rabbits from Heifer. He went on to become a millionaire raising rabbits and helped bring water and schools to his village. In another example, a woman born in a poor village in Zimbabwe went on to earn a doctorate degree in the United States. Luck says her success was funded in part from income her aunt earned from a milk goat she received from Heifer. "That's what a goat did," she says. "That's one example. The animal's only the catalyst. That's the beginning of many other things that follow." While Heifer works to bring opportunities to women, Luck says it's important to respect the local culture. She describes working with the Masai in east Africa. The women tended the livestock, but the men managed the income. When she suggested the women should receive training in animal husbandry from Heifer, Luck says the chief initially said no. "And I said I would never disrespect your culture. I'm a guest in your home. But I do think you could triple the liters of milk. I do think you could double the offspring. We were beginning to talk economics. In about a month or so, he decided to try it. And the women were so successful, so that the men have been empowering them and joining them in partnership." David Beckmann, president of Bread for the World, leads a grassroots effort to lobby the US Congress to help the poor. Sharing this year's World Food Prize with Heifer's Luck is David Beckmann, president of Bread for the World. The prize committee cited the impact Beckmann's leadership of the non-profit group has had on U.S. policies fighting global hunger and poverty. Bread for the World's highly successful grassroots lobbying campaigns recruit hundreds of thousands of people from churches across the United States. They call, write and visit their members of Congress to support policies that help the poor. The World Food Prize citation credits these efforts over the past decade for quadrupling U.S. aid to Africa and more than doubling aid to needy families in the United States. Beckmann points to the tripling of US global development assistance, to $22 billion this year, as one of the organization's biggest successes. "I think that wouldn't have happened without the advocacy of hundreds of thousands of people and churches that are part of Bread for the World and that keep the pressure on their members of Congress." 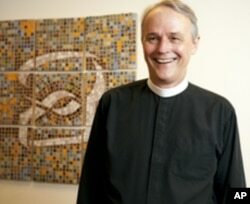 Beckmann, a Lutheran pastor, is an economist who spent 15 years with the World Bank before joining Bread for the World. He also has worked with groups of many other faiths, and non-denominational organizations, to support policies that end poverty and hunger. "People have different ideas about God," he says, "but if a mother can't feed her children, and five or 10 years later she can feed those kids and they're in school, then clearly, by anyone's religion, that is something sacred and wonderful." The World Food Prize Committee said that, in choosing Bread for the World's David Beckmann and Heifer International's Jo Luck to receive the $250,000 prize, it was recognizing the critical work that non-governmental organizations do to fight hunger worldwide. The World Food Prize was established 25 years ago by the late Norman Borlaug. The American plant scientist won the 1970 Nobel Peace Prize for his work breeding new varieties of crops that dramatically increased wheat and rice production. Borlaug's work is credited with ushering in the so-called Green Revolution in agriculture and averting famine in Asia in the 1960s.